Over the last few weeks I've taken you through the basic set up of an invitation, from the overall anatomy of an invitation, whose names to include, how to write the bride and groom names, and lastly, how to write the time and date. This month I'm moving on from the invitation to accompanying pieces, and today we're taking a look at the reply card. The reply card is a small, but mighty, little card. There's often a LOT of information packed into a tiny card, and it needs to be a multifunctional work horse. It often reiterates who is invited, let's guests know when & how to respond, it may sometimes need to collect meal selections or dietery limitations, and it should always involve a secret coding method to track who each card belongs to. PHEW! Give the reply card a standing O - for such a tiny card, it really has it's work cut out! REPLY DATE: The standard reply date is 4-6 weeks before the wedding, or 6-8 weeks before a destination wedding. Always remember that you use the word "before" instead of "by" for the date. For example, "kindly reply before the tenth of May". REITERATE WHO IS INVITED: The reply card is a great way to remind guests of who/how many folks are invited. You can have a line that says "please list the names of all guests" so that you know exactly who is responding; you can also have "adults only" on the reply card (instead of on the invitation itself). If you aren't using an inner/outer envelope system, and are concerned that guests may not know how many seats you are reserving for them, you can include a line on the reply card that says "____ seats reserved in your honor". You would fill the line in, and it let's guests know how many seats they can respond for. This is another way to let families know that their children aren't invited. MEAL OPTIONS: A lot of venues/catering halls require meal selections or food allergy requests be made before the wedding day. All stationers, myself included, are ready & able to adjust the reply card design to fit the meal selections. I love playing with little graphics to illustrate the menu items. 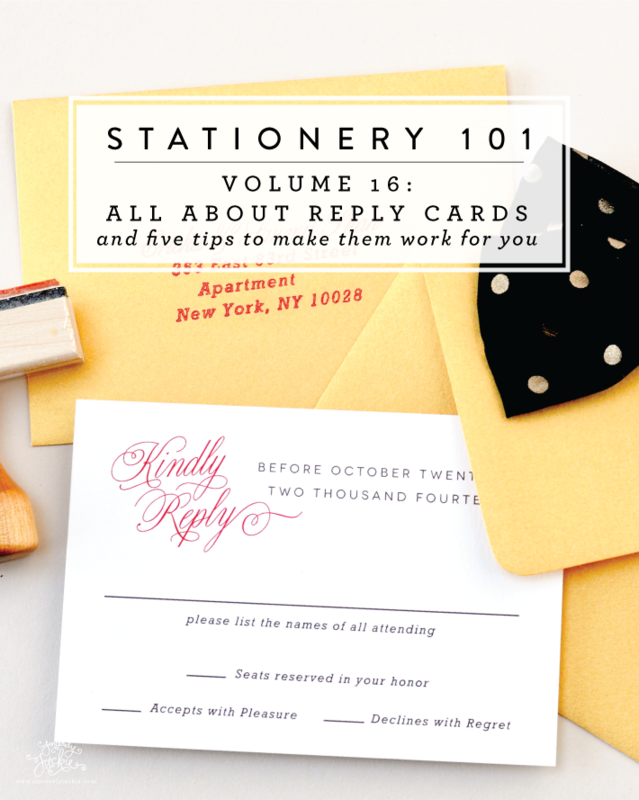 NUMBERING YOUR REPLY CARDS: Being organized with your reply cards is SO IMPORTANT. You WILL have cards that come back filled out incorrectly, and you WILL have a whole bunch of friends & family that won't reply in time, leading you to have to stalk them and find out whether or not they are attending. It's a frustrating task, but so much easier if you discretely number each reply card. Coordinate each reply card to your guest list, so that as the cards come back you know exactly who they are from. I remember for my own wedding I got a reply card back that said "Myself +1" on the guest line. Huh?? Well, I had numbered each reply card and was able to look up that card (which was number 76) belonged to one of my husbands' friends. I also had around 4 couples reply "Mr. and Mrs. Quartuccio" (my maiden name) so numbering the reply cards allowed me to look up which couple was which. DO IT! POSTAGE: Don't forget to include postage on each reply envelope. A forever stamp should do the trick. However, you may want to omit postage if the invitation is being sent internationally, as your guest may need to buy their own postage. There you have it! My top five tips for making your reply card work for you. Do you have any other tips for reply cards? I would love to hear them.